Stephen is arrested on false charges and put on trial (Acts 6: 11-15). 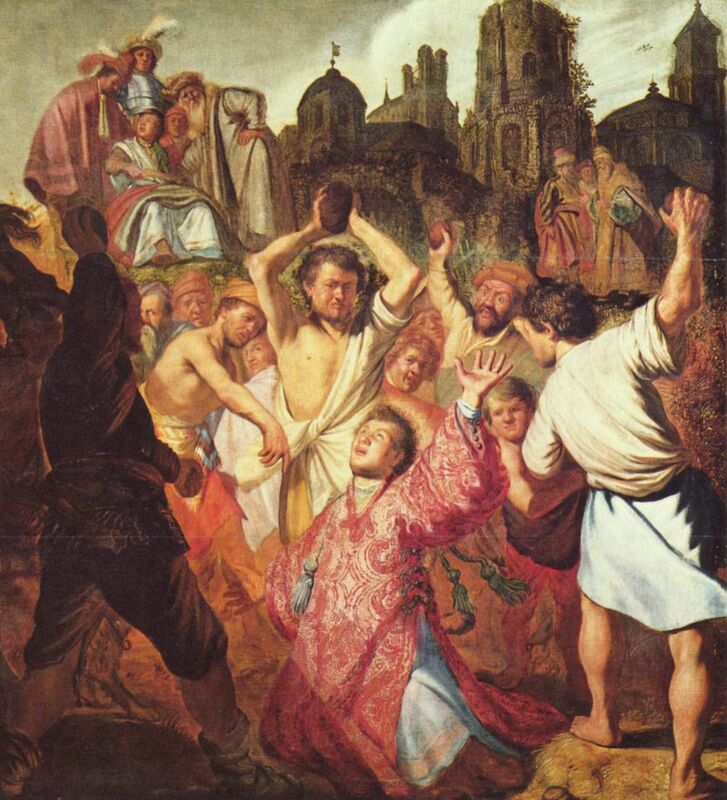 The false charges against Stephen concern his attitude toward the Law and the Temple. Luke is clear that these are false charges against Stephen. He is not against the Law or the Temple. The charges are similar to those brought against Jesus when he was before the Sanhedrin. Ben Witherington observes that Luke is patterning the death of Stephen after the trial and execution of Jesus. There are at least ten things the two trials have in common, and two which only appear in Luke/Acts. First, both Jesus and Stephen commit their spirit to God and second both pray for forgiveness for his accusers. This is an important observation since in the Gospels the Jewish people reject Jesus as the Messiah, in Acts they are rejecting the promised Holy Spirit, the foundation for the Messianic Kingdom. Both rejections are punctuated by an execution of an innocent man. This in no way says anything about Stephen being exactly like Jesus. It is significant, however, that the first time a Jesus-follower is executed he dies just like Jesus did. As for the charges, perhaps Stephen used Jesus’ statement that he would destroy the Temple and rebuild it in three days or his prediction the Temple would be destroyed in the near future in his preaching in the Synagogue. This could have been used against him in the same way Jesus was accused of threatening the Temple. Both Jesus and Stephen stand within a grand tradition of offering a critique of the Temple and the Priesthood. The prophets of the Hebrew Bible frequently condemned the priests and Temple worship (Jer 7, for example). The Essenes represent a Second Temple period critique and condemnation of the worship nearer the time of Jesus. A Jew saying the High Priest and Temple was corrupt was not particularly revolutionary–but to say the work of your teacher replaced the work of the Temple would have been radical. Stephen represents a different strata of Second Temple period Judaism which has the potential to be more open to the gospel of Jesus as Messiah and the coming Kingdom of God. But just like the Judean Jewish leadership, the synagogue of the Hellenists resist the Holy Spirit as well. Stephen is therefore arrested like the Apostles have been before. But in this case, Stephen gives a lengthy prophetic sermon condemning the Jewish aristocracy for their resistance against the Holy Spirit, leading to his dramatic execution at the end of chapter seven and the equally dramatic introduction of Saul of Tarsus, persecutor of the church. Here is a problem for the readers of Acts. Luke chose to place this story where he did, balancing his historical, literary and theological motives. Is this solely a critique of the Temple? What is happening in the unfolding story of salvation history in Acts 6-7? What is Luke’s point in placing this arrest, prophetic speech and lynching of Stephen at this point in his narrative?